Megan Wilson’s Flower Interruptions are a playful response to the monotony of the predictable and day-to-day routine. Through these installations Wilson aims to create an unexpected environment of joy and delight for viewers/ participants. 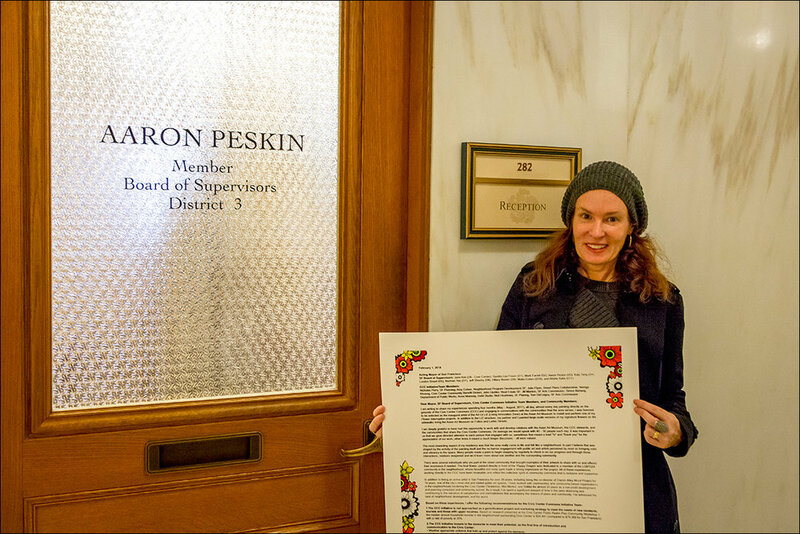 Megan Wilson outside of San Francisco's City Hall with her Letter to Civic Center Commons Stakeholders. 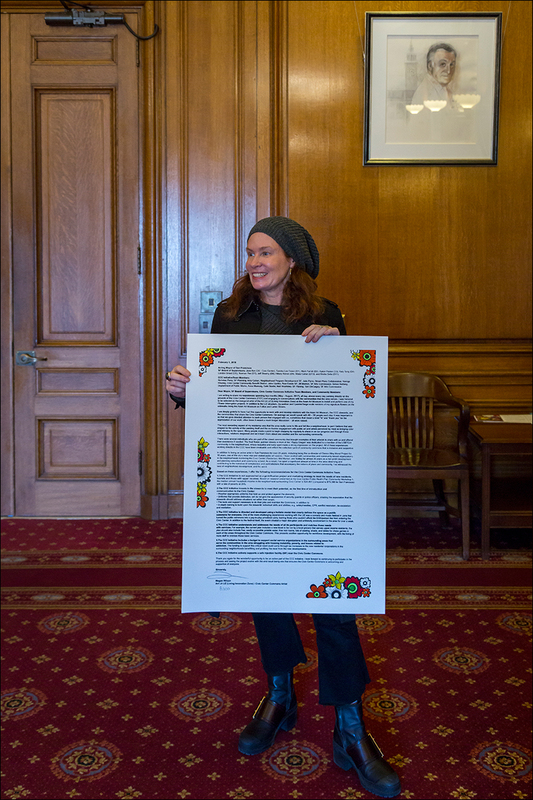 Following her residency at the Asian Art Museum, Wilson created A 22" x 30" silkscreened letter/artwork to San Francisco's Mayor, Board of Supervisors, Civic Center Commons leadership team, and stakeholders providing recommendations for the CCC Initiative and the CC Public Realm Plan. Wilson's recommendations are based on having spent four months, all day, almost every day painting directly on the grounds of the Civic Center Commons (CCC) and engaging in conversations with the communities that the area serves. 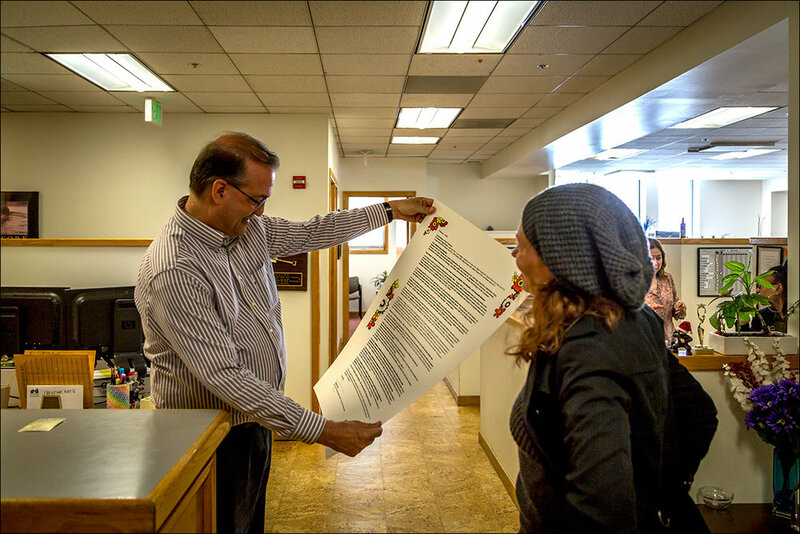 The letter was written and designed by Wilson and printed by master printer Calixto Robles. 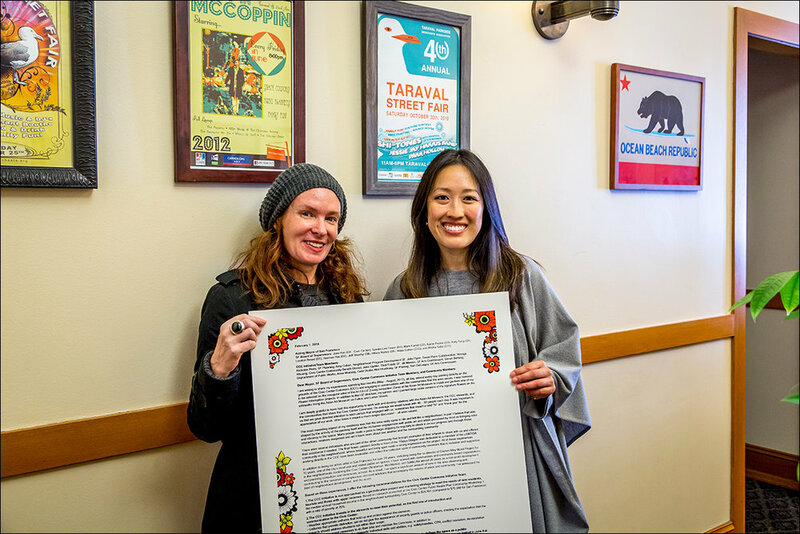 In addition, broadsides are being given to community-based organizations who serve the communities surrounding the Civic Center Commons, primarily the Tenderloin neighborhood. 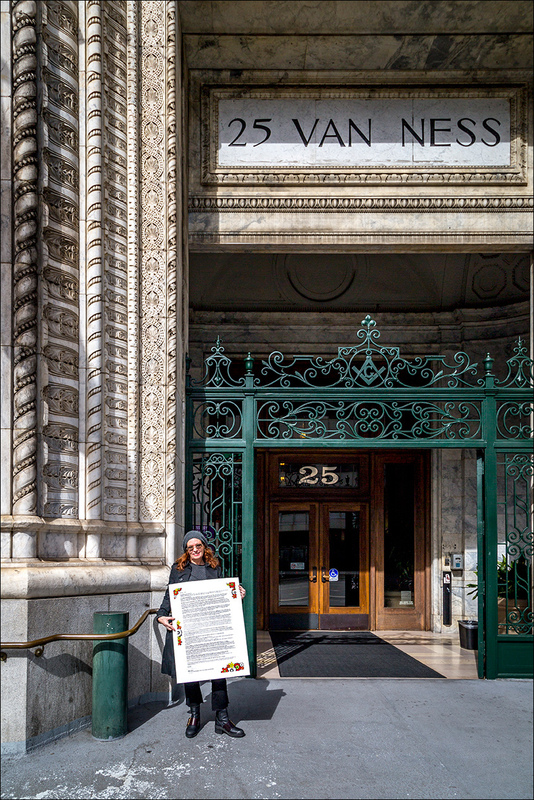 I am writing to share my experiences spending four months (May – August, 2017), all day, almost every day painting directly on the grounds of the Civic Center Commons (CCC) and engaging in conversations with the communities that the area serves. I was honored to be selected as the inaugural artist of the Art Lit LIZ (Living Innovation Zone) at the Asian Art Museum to install and perform one of my Flower Interruption projects. 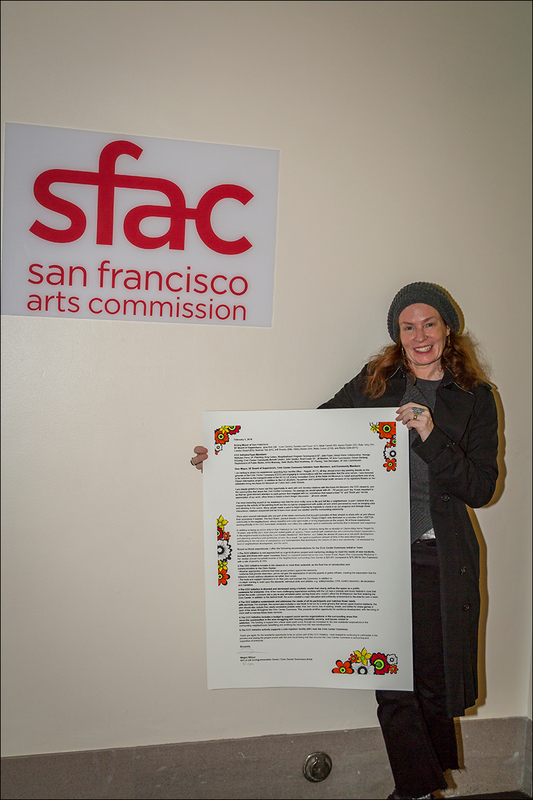 In addition to the LIZ structure, my partner and I painted large-scale versions of my signature flowers on the sidewalks lining the Asian Art Museum on Fulton and Larkin Streets. 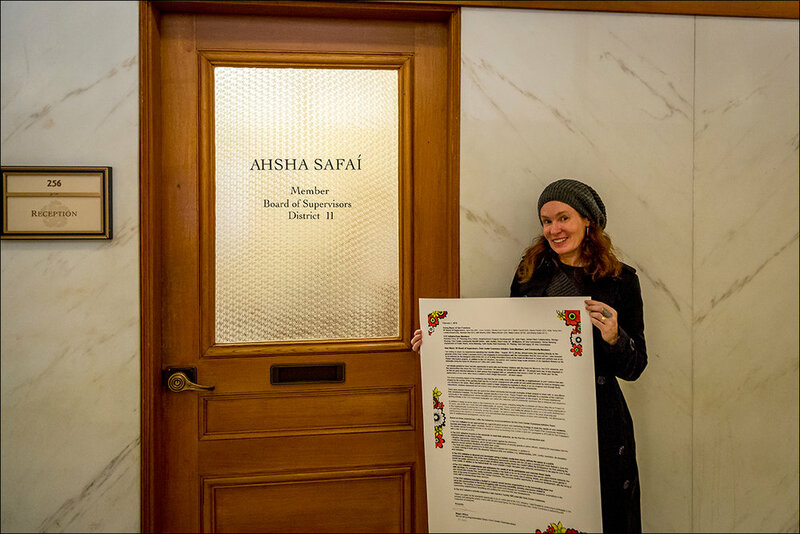 I am deeply grateful to have had this opportunity to work with and develop relations with the Asian Art Museum, the CCC stewards, and the communities that share the Civic Center Commons. On average we would speak with 40 – 50 people each day. It was important to us that we gave directed attention to each person that engaged with us; sometimes that meant a brief “hi” and “thank you” for the appreciation of our work, other times it meant a much longer discussion – all were valued. The most rewarding aspect of my residency was that the area really came to life and felt like a neighborhood. In part I believe that was shaped by the activity of the painting itself and the no-barrier engagement with public art and artists perceived by most as bringing color and vibrancy to the space. Many people made a point to begin stopping by regularly to check in on our progress and through those interactions, relations deepened and we’d learn more about one another and the surrounding community. There were several individuals who are part of the street community that brought examples of their artwork to share with us and offered their assistance if needed. 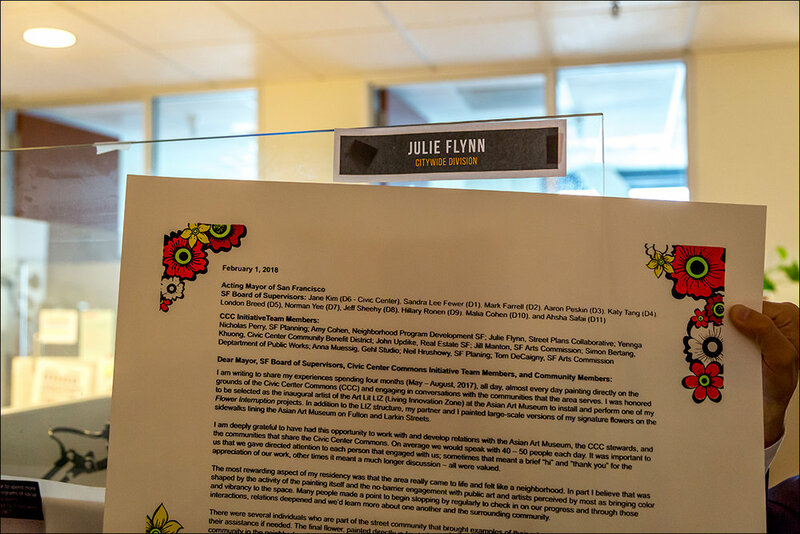 The final flower, painted directly in front of the ‘Happy Dragon’ was dedicated to a member of the LGBTQIA community in the neighborhood, whose beautiful and lively spirit made a strong impression on the project. All of these experiences working directly in the CCC have been invaluable and reflect the collective spirit of community commons that is inclusive and supportive. 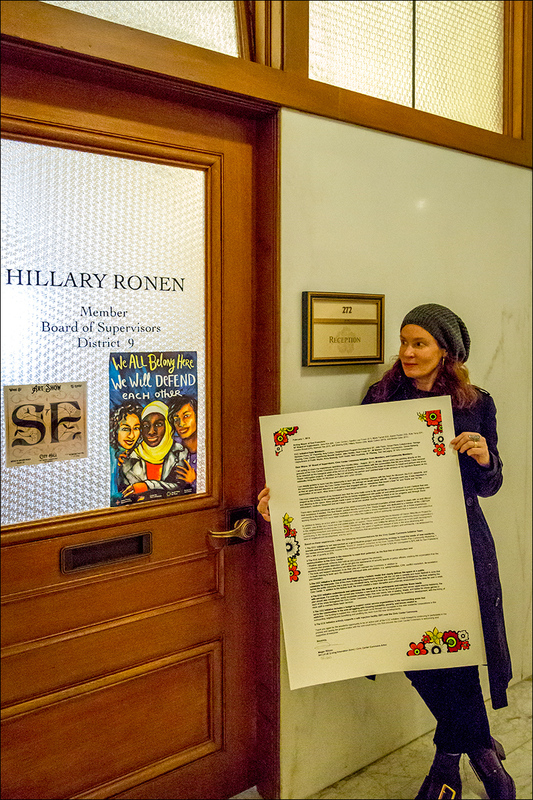 In addition to being an active artist in San Francisco for over 20 years, including being the co-director of Clarion Alley Mural Project for 10 years, one of the city’s most vital and visited public art spaces, I have worked with communities and community-based organizations in the neighborhoods bordering the Civic Center (Tenderloin, Mid-Market, and SoMa) for almost 20 years as a non-profit development and planning consultant and community activist. As a result, I’ve spent a significant amount of time in the area observing and contributing to the narrative of complexities and contradictions that accompany the notions of place and community. I’ve witnessed the best of neighborhood development, and the worst. 1. 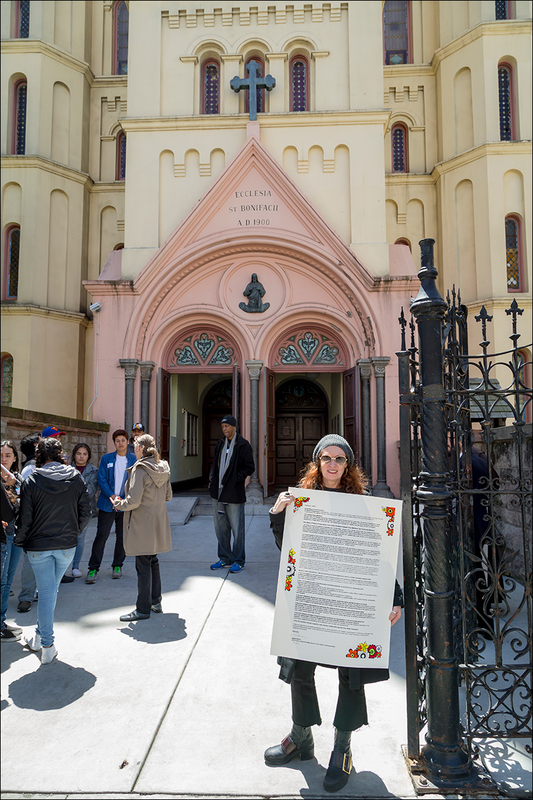 The CCC Initiative is not approached as a gentrification project and marketing strategy to meet the needs of new residents, tourists and those with upper incomes. Based on research presented at the Civic Center Public Realm Plan Community Workshop 1, the median annual household income in the neighborhood surrounding Civic Center is $24,491 (compared to $79,388 for San Francisco) with a rate of poverty at 25%. • In-depth training to build upon the stewards’ individual skills and abilities, e.g. safety/needles, CPR, conflict resolution, de-escalation and mediation. 3. The CCC Initiative is directed and developed using a holistic model that clearly defines the space as a public commons for everyone. 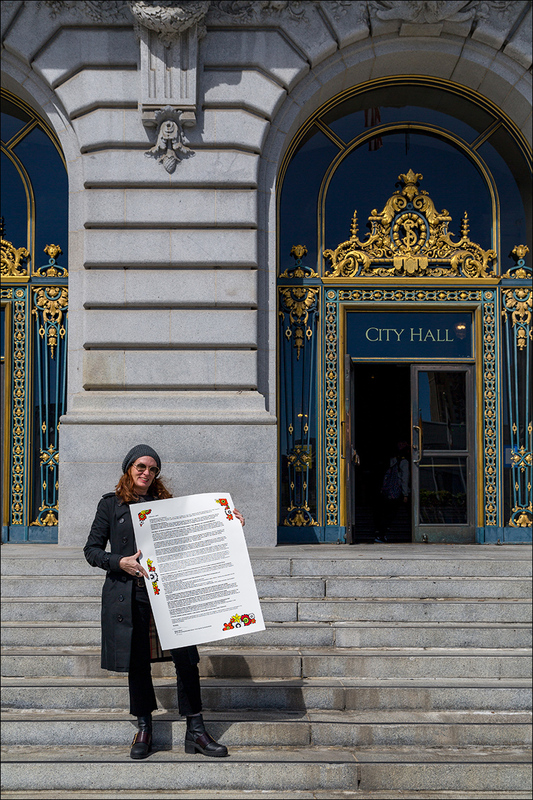 One of the more challenging experiences working with the LIZ was a comedy and music festival in June that turned the public commons into a pay-to-play privatized party, barring those who couldn’t afford the $100/person fee from entering the Civic Center. In addition to the festival itself, the event created a major disruption and unfriendly environment to the area for over a week. 4. The CCC Initiative understands and addresses the needs of all its participants and matches those needs with services. For example, the current plan includes a new kiosk to be run by a local grocery that serves upper-income residents; the plan should also include free, easily accessible potable water, free rest rooms, lots of seating, shade, and tables for chess games in each of the areas throughout the Civic Center Commons. This presents another opportunity for workforce development, with the hiring of more staff to oversee these basic services. 5. The CCC Initiative includes a budget to support social service organizations in the surrounding areas that serve the communities in the area struggling with housing instability, poverty, and issues related to addiction. 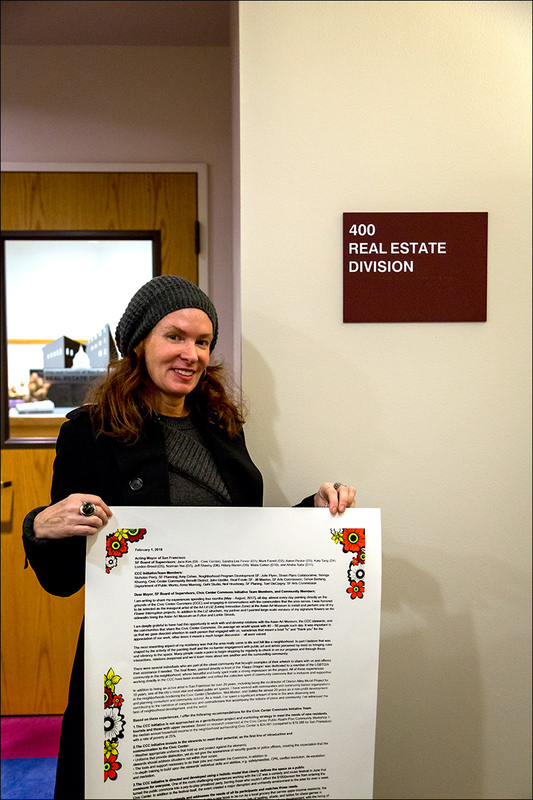 The funding to support this critical need could come through tax increases to the new residents/ corporations in the surrounding neighborhoods benefitting and profiting the most from the new developments. 6. 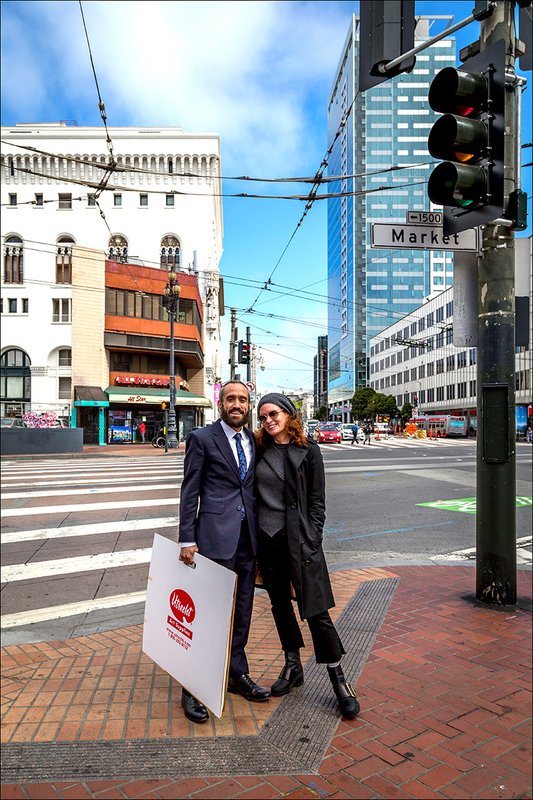 The CCC Initiative actively supports a safe injection facility (SIF) near the Civic Center Commons. Thank you again for the wonderful opportunity to be an active part of the CCC Initiative. 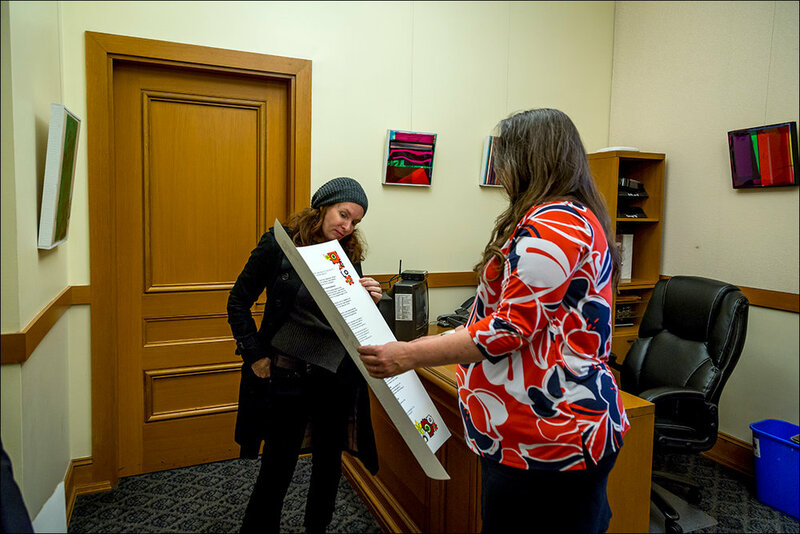 I look forward to continuing to participate in the process and seeing the project evolve with the end result being one that ensures the Civic Center Commons is welcoming and supportive of everyone.